Kitchen Window: The Many Melons Of Summer It's hard to beat a plain slice of cool melon on a hot day. But old standbys like cantaloupe and honeydew are now joined by more exotic varieties in the markets, and their subtleties are worth exploring — in soups, salads and other creative dishes. Get recipes for Watermelon Marinated in Toasted Sesame Oil, Cantaloupe and Crab Soup, Honeydew Granita with Midori, and Charentais with Port and Bacon. When I was growing up on our farm in east Tennessee, we always had a melon patch. I'm not sure what varieties my parents tried besides cantaloupes and watermelons, but knowing them, it was probably most anything they could get seeds for. Disease, pests and lack of water eliminated most varieties after a single attempt; cantaloupes lasted a few planting seasons longer and watermelons longer still. Even the watermelons didn't do well, but they did well enough that we'd have a few every summer, fresh picked in the morning and chilled all day. My parents claimed if we swallowed the seeds they'd sprout in our stomachs, but I swallowed them anyway after a brief seed-spitting competition with my siblings. My favorite summer breakfast is chilled cantaloupe and several rashers of good American bacon on the side with cheese (brie, blue or chevre) and a croissant. If I get up early enough, I enjoy this on my balcony, before the day's heat becomes oppressive. That garden of my childhood existed in the '60s, and there were few seed options. My parents might well have had more success today with more — and more adaptable — varieties. As someone without a garden, though, I'm hugely thankful for the different melons now available in supermarkets and, even more so, at farmers markets. I always like to eat a slice of melon, but that's just the beginning. I use melons in salads, chilled soups, dressed with sweetened yogurt and mint, in granitas and even grilled. Melons are members of the same botanical family as cucumbers, squash and gourds. Unlike zucchini and cucumbers, however, they're lusciously sweet (at least the ripe ones), and unlike luffas, they're edible and not good for scrubbing in the tub (although cucumber-melon bath additives are popular). Most familiar melons are cultivars (variations of) of the muskmelon (Cucumis melo). 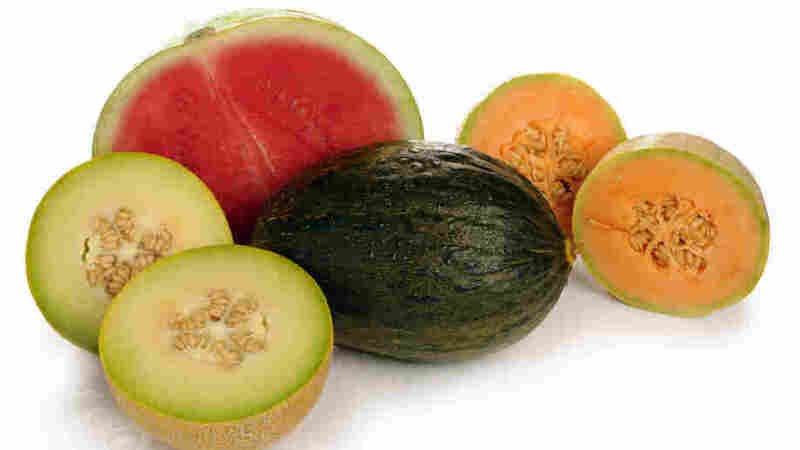 This list includes cantaloupe, honeydew, casaba and Crenshaw melons. They're distinctive for their hollow, seed-filled interior. Watermelons (Citrullus lanatus) are relatives. After working as editor of various computer magazines, Kevin D. Weeks is now a personal chef in Knoxville, Tenn. Weeks also teaches cooking classes, is the guide to Cooking for Two at About.com, and blogs at Seriously Good. These days you may be able to find melon varieties such as the French charentais (which looks like a cantaloupe and also has orange flesh but has deep greenish ribs running top to bottom), horned melons, canary and galia at some supermarkets or farmers markets. And new varieties appear often. Although they all have similar flavors, they have subtleties worth exploring. Some are closer to their muskmelon roots, while others are less aromatic. Choosing a ripe melon can be tricky. In all varieties, the belly button should have no trace of stem, and the melon should be firm overall but slightly soft at the blossom end. Check the spot on the melon where it rested on the ground, it should be a creamy golden-colored oval, distinctive but not too large. Rough-skinned (netted) melons are easiest. The netting should be distinct and raised, the background should have almost no green tinge, the belly button should have no trace of stem, and there should be a distinct melon odor. If you can't smell a netted melon, don't buy it. Smooth-skinned melons are more difficult to choose. Their appearance can be deceptive, and they have little odor. The skin will feel waxy. At farmers markets, look for brown flecks on the skin. These are called sugar spots and are an indication of ripeness. Produce managers at stores usually wash them off. Store whole melons at room temperature if they are under-ripe. They will continue to ripen and develop complexity. Most melons are best served chilled (a plus when the temperature is 95 and the humidity is 70 percent), but not cold. Like white wines, they are best at 50 to 55 degrees, but the flavor is muted at the 40 degrees of most refrigerators, so pull completely chilled melon out of the refrigerator 30 minutes before serving if you can. My favorite summer breakfast is chilled cantaloupe and several rashers of good American bacon on the side with cheese (brie, blue or chevre) and a croissant. If I get up early enough, I enjoy this on my balcony, before the day's heat becomes oppressive. While it's exciting to have such melon variety now, I still appreciate the simple classics of my parents' garden. I was planning a summer dinner party for my favorite client, and I thought an amuse-bouche (a small bite often served between the appetizer and entree) would be fun. 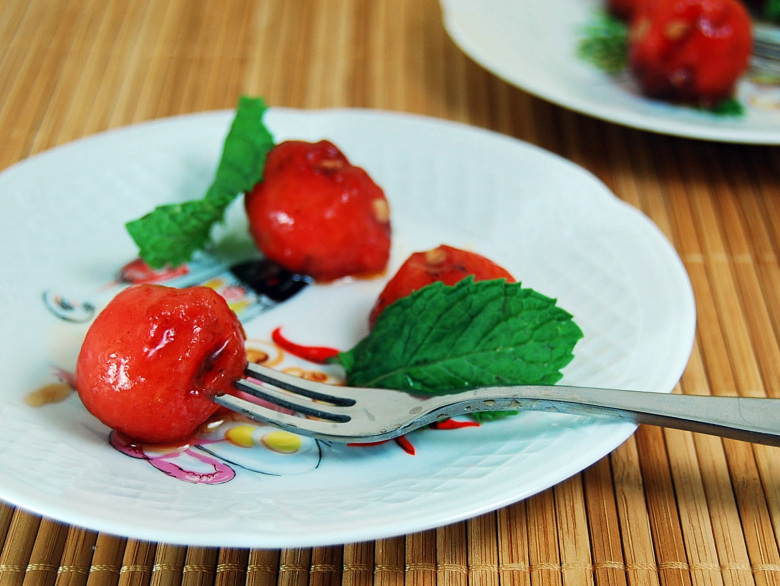 The idea I came up with was marinating watermelon in toasted sesame oil and sherry vinegar with mint. Serving logistics prevented serving the amuse-bouche, so instead I used the watermelon as a tasty garnish on the plate. It was a hit. You could also add some sliced red onion, goat cheese and fresh mint to make it a salad. Combine all ingredients except salt in a zippered bag, gently toss to coat and refrigerate 1 to 3 hours. Toss gently once or twice more. For an amuse-bouche, spear melon balls on a cocktail fork or short bamboo skewer and serve on a small plate. For garnish, arrange 3 or 4 balls on the plate before serving. In both cases, sprinkle a few crystals of sea salt on the melon just before serving. When I first ran across this recipe by Chef David Meyers on FoodandWine.com, the flavor combination of crab and cantaloupe leaped into my mouth and set off a tsunami of digestive juices. It's particularly good with Dungeness crab, but any crab will work. It makes a lovely summer lunch or brunch with a green salad, but it's also a good soup course for a party. 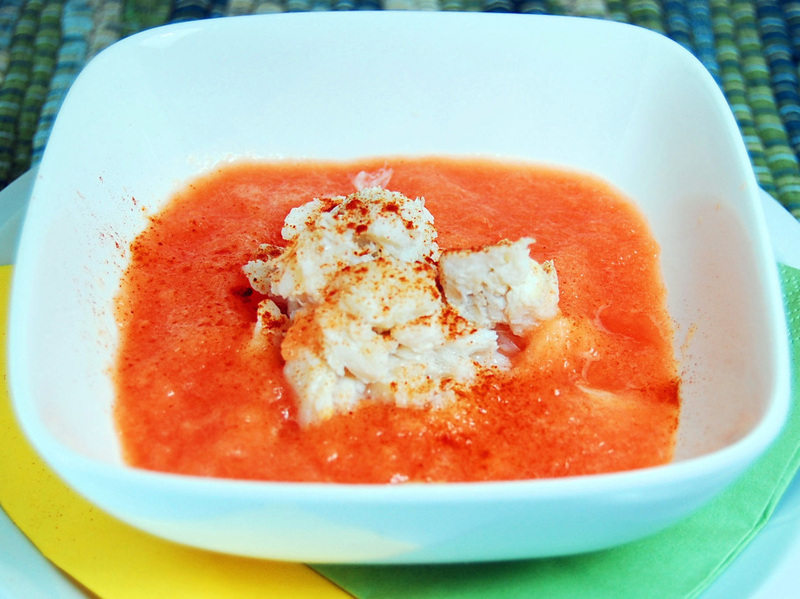 Combine crabmeat, shallot, lemon juice, oil and 2 teaspoons paprika in a bowl and season lightly with salt. Set aside to marinate for 30 minutes. Combine water, sugar and remaining teaspoon paprika in a small saucepan over medium-high heat, stirring, until sugar is dissolved. Pour into a food processor and cool. Add the melon to the processor and process until smooth. Mound the crab in the center of 4 shallow bowls. Pour the soup around the crab and serve immediately. Granita, an Italian ice, can be made from almost any pureed fruit (or other liquid), and melon is a particularly good choice. 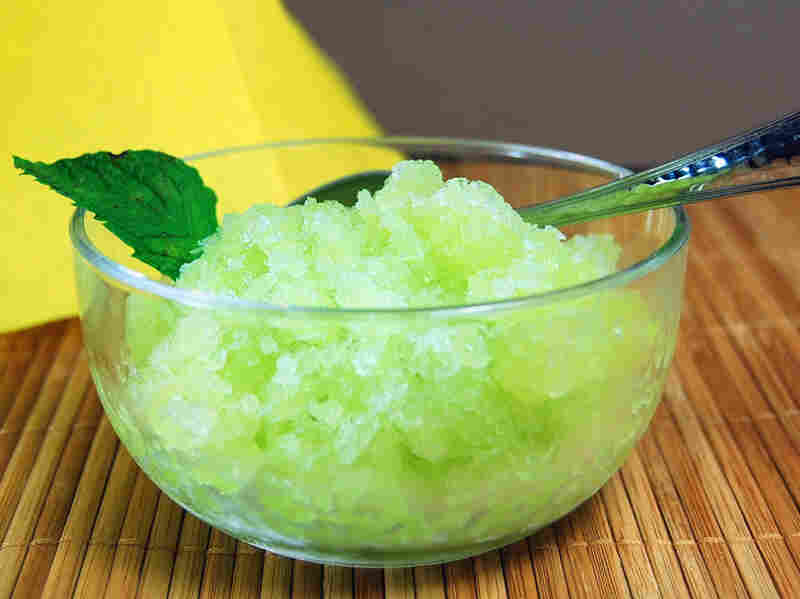 This honeydew granita makes a delicious and refreshing light summer dessert. The addition of Midori (a Japanese honeydew liqueur) makes it more intense, and the floral notes of lavender are a surprising complement. Combine sugar, water and lavender in a small saucepan. Bring to a boil, stirring until sugar is dissolved. Remove from heat, cool and strain into a blender. Add remaining ingredients and process until smooth. Pour mixture into an 8-inch square baking dish and freeze for 6 hours. Once an hour, remove and stir well with a whisk. When the mixture becomes too thick for the whisk, use a fork. This reincorporates the ice crystals building up around the edges back into the liquid. The goal is to end up with a dish full of ice crystals, not a block of ice. Stir again before serving and garnish with fresh lavender flower or a twist of lime peel. You may be familiar with the combination of melon wrapped in prosciutto — a delicious combination of sweet and savory. However, you may not be familiar with the equally august combination of melon and port. I got to thinking (an often dangerous proposition) and wondered why not combine the two and riff off of my fondness for melon and American bacon? The peppery arugula is a perfect complement, and if you can't find a charentais melon (a chanterais looks like a cantaloupe and also has orange flesh but has rather deep greenish ribs running top to bottom), cantaloupe also works. Place melon in a large zippered bag and add port. Marinate in the refrigerator for 8 to 12 hours. Warm 1/2 hour before serving. In a small bowl, whisk together the olive oil, vinegar, mustard, shallot and 1 tablespoon of the port used for marinating. Arrange some arugula on a plate and set a melon wedge on top. 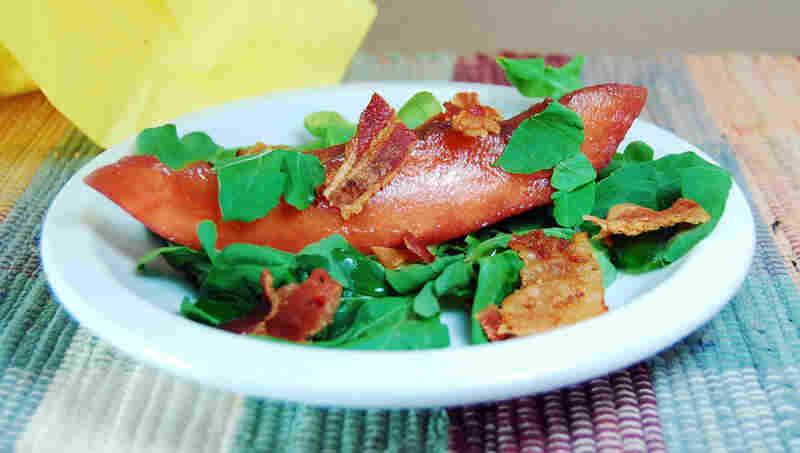 Lightly drizzle melon and arugula with the vinaigrette then sprinkle with bacon. Serve the port used for marinating on the side for sipping. It's really good.